On this image you can see two infrared frames of the same area on Mars. 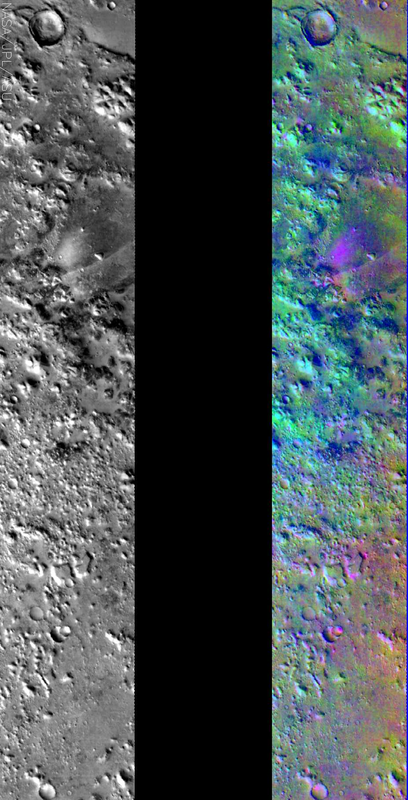 One of the images (in black and white) represents a single wavelength or band of the THEMIS IR instrument, while the other image (in false color) represents 3 different bands. The image with the various colors was created with a technique called Decorrelation Stretch (DCS). In this technique individual bands of the THEMIS IR instrument are stretched to better show compositional variations throughout the whole range. After the bands are stretched they are overlayed on one another and colors are assigned to each band. This makes up the colors in the image. As you can see, there is a difference in what is noticable in the single band IR image versus the false-colored one. On the color image the pink/magenta colors usually represent basaltic content, cyan often indicates the presence of water ice clouds, while green can represent dust. The bright purple and pink colors associated with the valley are due to basalt. There may be a thin veneer of dust present in the region (it was a dark colored region during the Viking mission in the 1970's) through which the basaltic material pokes out along the edges of the valley and the nearby knobby terrain. The windstreak in the lee of the small crater is also likely to represent basalt.